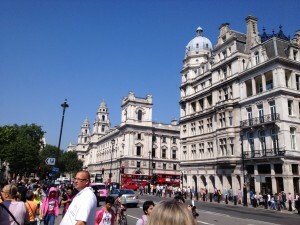 “Everyone should study abroad.” I’d heard this from countless people before embarking on my trip to London. After this once in a lifetime opportunity, I must say I agree with the sentiment. Study Abroad is 100% better than just taking the money and going to whatever city you want to go to. 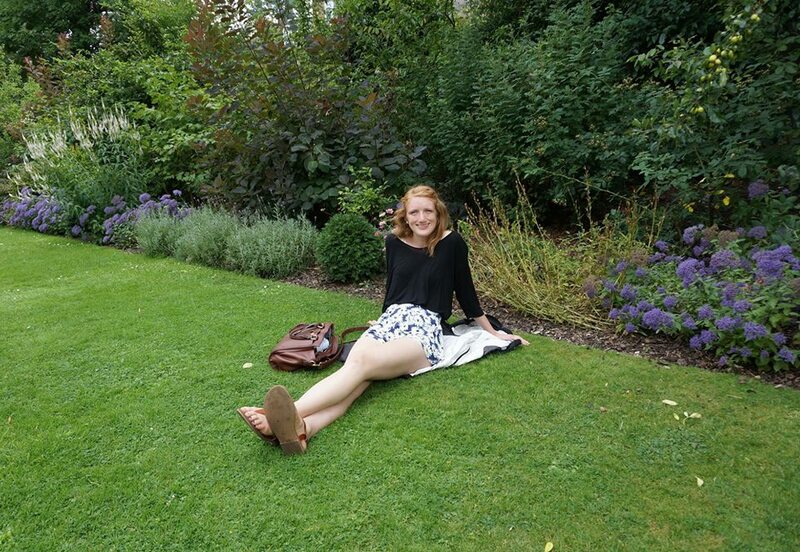 Study Abroad gave me the opportunity to live in a true Londoner’s house, made a schedule for our group, used our student status to our advantage, and allowed me to make connections from what I was seeing to my learning. Being able to stay in a home stay was a huge benefit for me. For one thing, it is definitely cheaper than staying in a hotel, and much less creepy than staying in a hostel. The best part of a home stay is that I was able to ingratiate myself further into London’s culture. I learned a lot from my host family, and ate breakfast, walked to the tube station, and went to bed in a true London fashion. Study Abroad also comes with a built-in schedule. CAPA tailor made a schedule to fit our needs, and ensured that we got student discounts and add-ons whenever possible. Without CAPA helping us, I doubt we would have been able to go to half the museums and events we planned. Finally, Study Abroad enabled us to make connections between what we did to what we were learning. Studies have shown that hands-on learning is the best way to retain knowledge, and I definitely agree with the sentiment. This trip was a three week hands-on learning experience. I remember much more about Charles Dickens and WWII because I was able to go to museums and see how Londoners respond to these things. It also created a connection that ran through our events. I think I am better able to remember what I did because I could connect it to my studies, rather than just saying I went to a bunch of museums or plays. 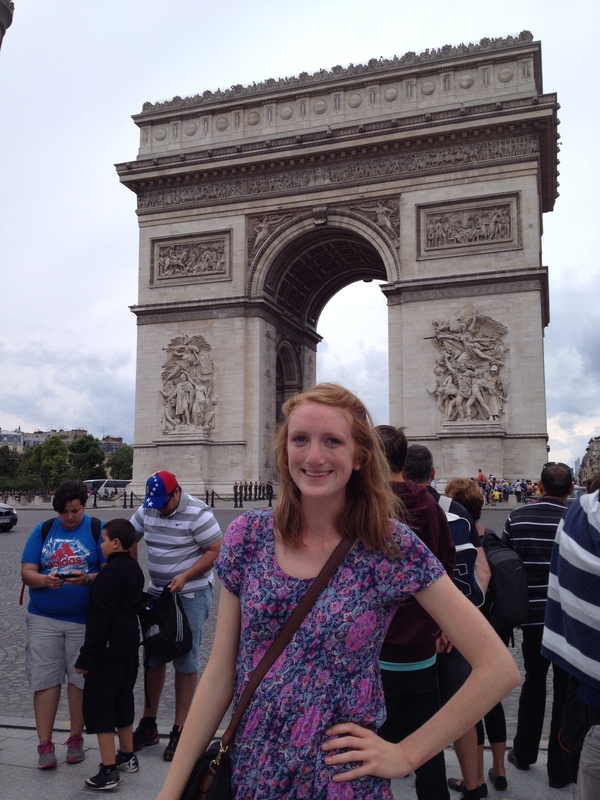 If you are someone who is considering studying abroad, please DO IT. If you are a UML employee thinking about authorizing a study abroad trip, please AUTHORIZE IT. If you are just a random person reading this blog, thanks for reading! Whatever the case may be, I am truly thankful for this amazing Study Abroad opportunity. I’ve made great friends, got to be a part of London’s culture (we started fitting in so well that on the last day someone on the street asked us for directions! ), and have so many stories to tell my grandkids. I’ve said it before, and I’ll say it again: LONG LIVE THE QUEEN. 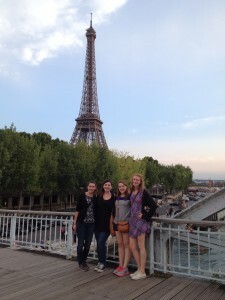 Over the weekend, Amanda, Maddie, Chelsea, and I went to Paris together! I’ve been to the city for a few days before on my trip in high school, but this excursion was so much different, and so much better. Being in London for three weeks has certainly taught us how to find our way around a city, and, perhaps more importantly, find our way around a subway system. Paris was beautiful, and the food was AMAZING. 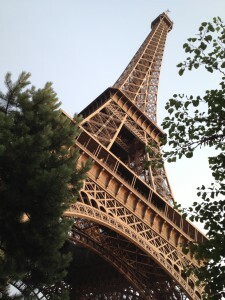 We were able to have a picnic-style meal by the Eiffel Tower, and then watch as it lit up as the night got darker. I also ate my weight in crepes. Hey, Paris isn’t somewhere I am going to go every day, so I need to eat all the banana nutella crepes I can get my hands on. 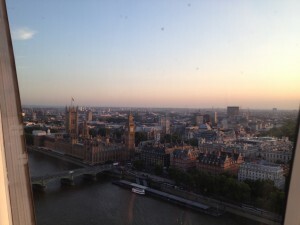 Although my weekend in Paris was wonderful, it made me appreciate London more. Part of it was definitely the language barrier. A lot of signs and announcements were translated into English, and most people spoke at least some English, but only knowing about five French phrases made getting around much more challenging. Paris is really a romantic and beautiful city, but London is somewhere I can see myself exploring for much longer. Even after three jam-packed weeks, there is still more I feel like I want to see. I also missed the culture of London. Everything seems more orderly here. The tube system makes more sense than Paris’s Metro, the city is cleaner, and, surprisingly, the fashion is better. Paris is perfect for a weekend getaway, but London is somewhere I could actually see myself living for quite a while. I’m really sad to be packing up tonight. I honestly wish I had chosen to study for a full semester here. I got to see so much, but I feel like I needed more time to explore the culture more. I would recommend studying in London to any student, and I would recommend jet-setting to Paris for the weekend to students in London as well! I love food. I go out to lunch all the time with friends at home, but London’s food is better than pretty much everything in Lowell. This week, we had two great lunch experiences. The first was at a Middle Eastern restaurant in downtown London, and the second was a picnic Greenwich Park. 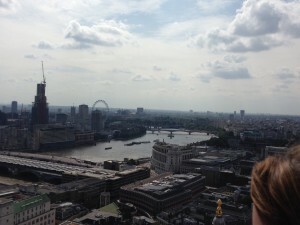 While the two lunch experiences were quite different, they both captured the spirit of London. London is an ever-diversifying city, and our trip to an Iraqi restaurant highlighted this. 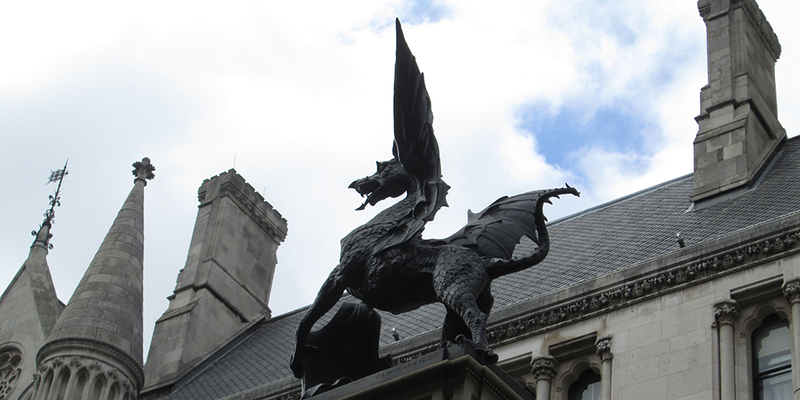 The overall culture in London is greatly affected by the various, smaller cultures within it. It was so cool to be able to experience authentic Iraqi cuisine, something I’d never experienced before (and was ridiculously delicious), in London. The food here is really more than just fish and chips. London’s culture is expanding and I think the vast array of restaurants featuring ethnic cuisine symbolize the growing acceptance of diversity in the city. Our lunch in Greenwich Park was much more casual. We bought bread, cheese, and milk chocolate digestives (which are the most amazing little cookies, they’re called digestives because apparently they have a lot of fiber), and we sat in the park eating and chatting. While we were in a completely different atmosphere from the sit-down, Middle Eastern restaurant, our picnic lunch seemed very “London” to me as well. Parks are everywhere here as a way for city dwellers to escape the hustle and bustle of London and relax in a calm, green area for a bit. A picnic lunch in the park was our way of stepping out of the city and relaxing in the grassy oasis of Greenwich Park. On a similar note, both our lunch outings brought together the entire group. I’ve always found that eating meals together is the best way to get to know each other. It is so nice to share stories with everyone. I hope we have the chance to have a couple more meals together before we depart on Tuesday! 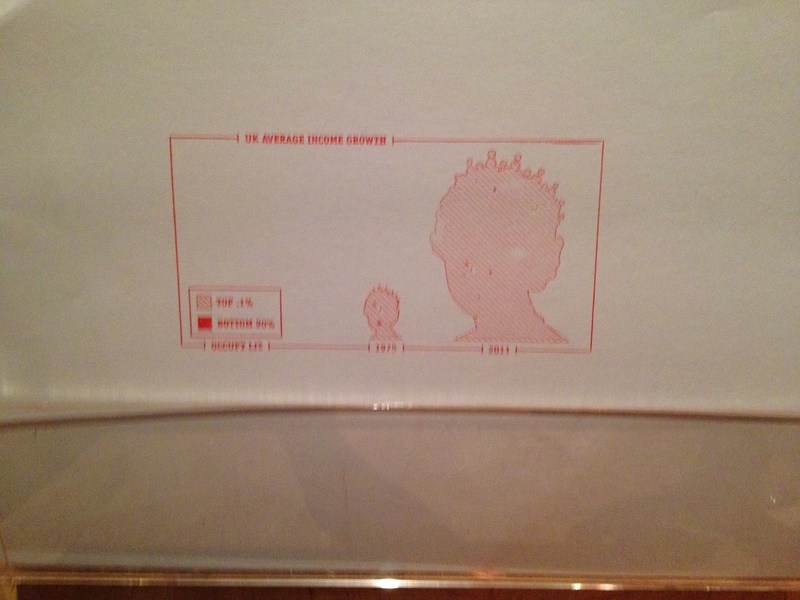 Today was part two at the V&A, and I’m really happy we went. 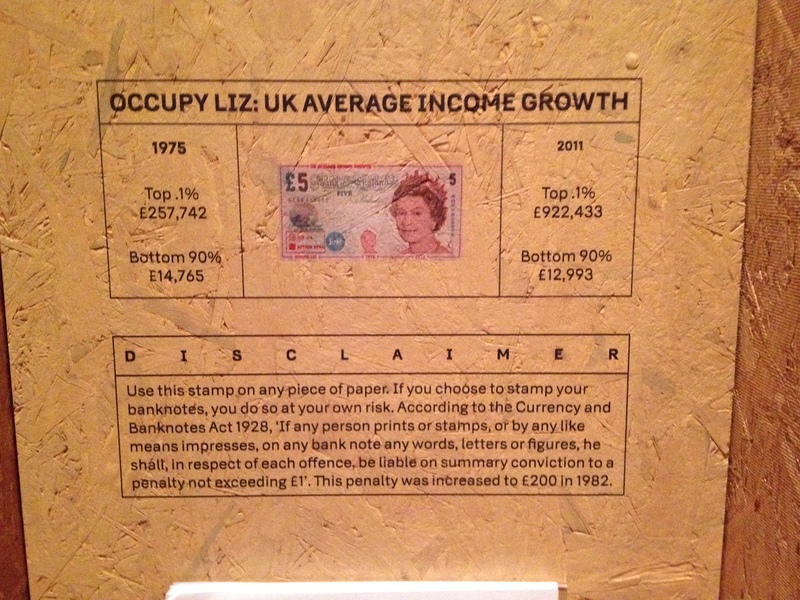 We spent our morning in the “Disobedient Objects” exhibit, which displays protest art from around the world. 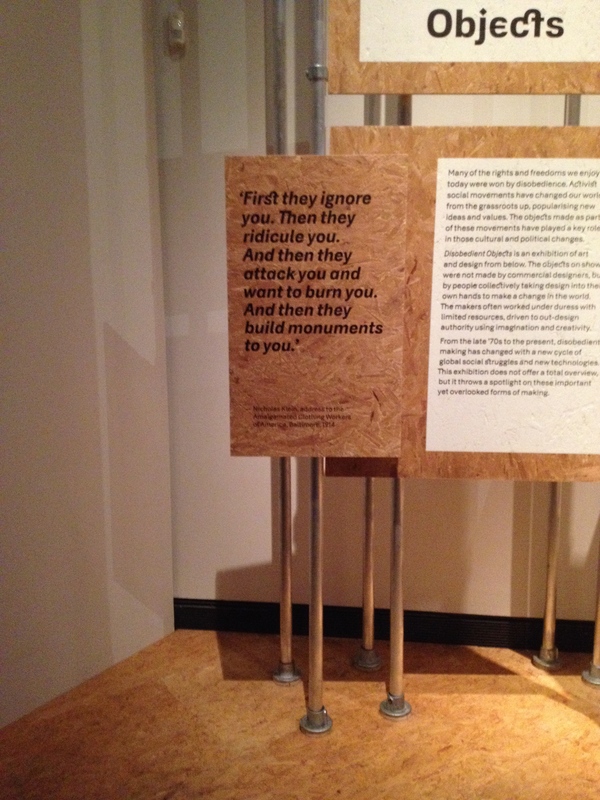 I thought the fashion exhibit would be my favorite from the trip, but “Disobedient Objects” has taken that title. I’ve always been a fan of street art, and I am very passionate about feminist issues, LGBT rights, and would consider myself anti-war in most cases (I guess you could say I’m a liberal), but I have never been involved in an actual protest. Something that caught my eye was the Occupy Wall Street art from America. Right next to it was the same idea but in England. 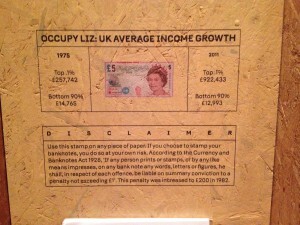 There was a stamp they used on 5 pound bills to highlight the distribution of wealth in England that went right over the picture of Queen Elizabeth. I have noticed so many differences between our two cultures, but we both seem to have similar economic issues and both handled them in similar ways. 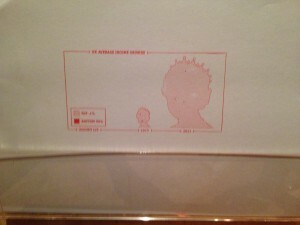 As a whole, the exhibit touched me. As I mentioned before, I have strong opinions on many social issues, but I have never participated in a protest. It is amazing to see how people have risked their lives to fight for equal rights, better treatment, and freedom in the face of oppression. 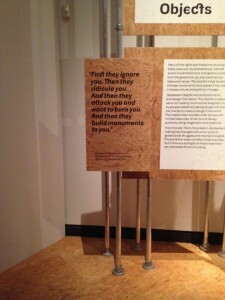 “Disobedient Objects” inspires me to take a more active stance on issues I care about. 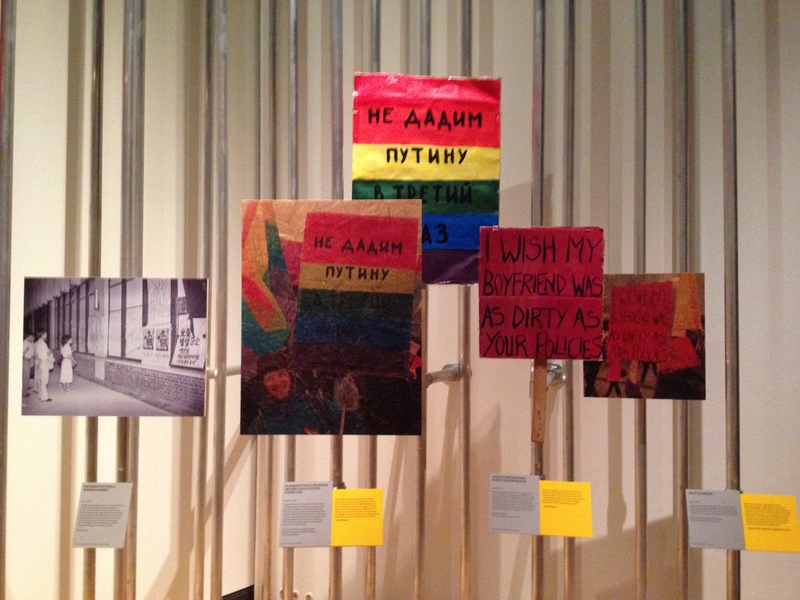 It makes me happy that the V&A was able to bring together all of these various protests from different corners of the world. 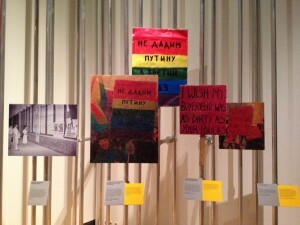 “Disobedient Objects” highlights how passion and creativity can become an effective protest. Yesterday was my favorite day of the trip thus far. We went to the Victoria & Albert Museum in the morning, and it was by far the best museum we’ve been to. 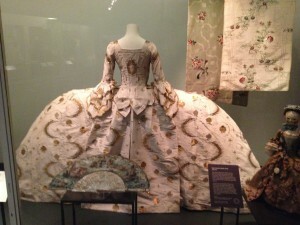 The exhibit of dresses from the past 300 years of British history was truly amazing. I’ve been enthralled with the fashion in London since I’ve been here. I try to keep up with the trends in America (well as much as I can on a Forever 21 budget), but I feel so far behind here! The dresses from the 18th and 19th century were beautiful and extravagant, yet they highlighted the ways in which women were treated: an object to look at, confined by a corset, and something to be consumed. Part of me finds these dresses so interesting and exciting to look at, but as what some would call a “raging feminist” these dresses make me so angry. It seems as though England and America’s pasts are very similar in the way they treated women. There are a lot of differences between the two cultures, but the fashion exhibit showed me that English and American cultures both have very anti-feminist histories. Nevertheless, I was mostly pleased with the fashion exhibit. It was so interesting to see British fashion, and British women, progress throughout history. 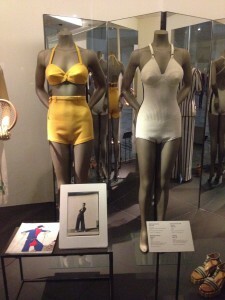 The vintage bathing suits and 1950s party dresses were my favorite parts of the exhibit. I could even see myself wearing both today. 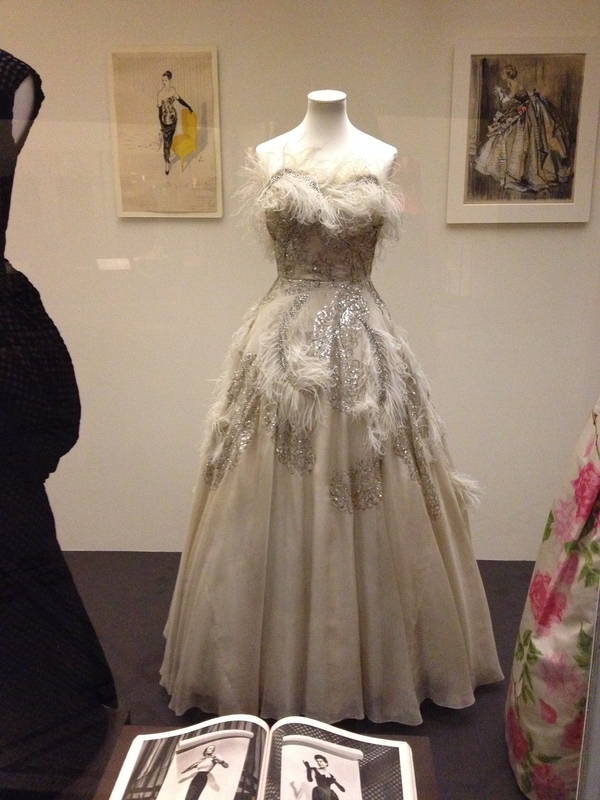 I loved the Victoria & Albert Museum, and although the fashion exhibit revealed Britain’s objectifying past, it inspired me to try and keep up with the fashion in London. I’m planning on doing some shopping here soon, so even if I can’t be as trendy as Londoners, hopefully I can bring some trends from here back to Lowell! 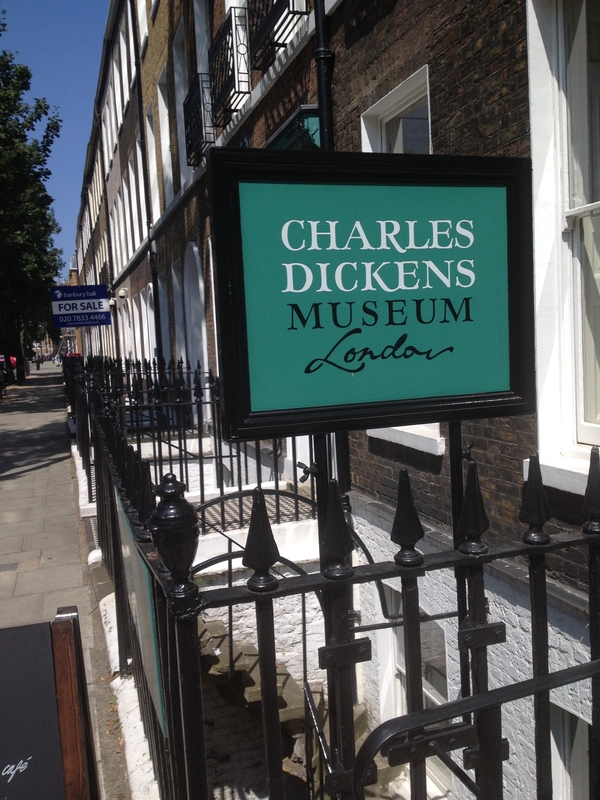 Today’s excursion was all about Dickens. I was really excited to be able to connect all of our Dickens readings to the city today. We’ve gotten bits and pieces of Dickens in London throughout the trip, but I felt like I could really connect to Dickens’s London today. Learning more about his environment helped me understand his works much better. Our day started with a tour from Ruth, who was a spectacular tour guide. She was so knowledgeable about Dickens. Ruth was a little eccentric and very personable. I thought people in London would be really reserved and proper, but my stereotype has been broken through all of the people we’ve met through our tours and simply just asking for directions. Walking tours are usually not my favorite, but her passion for Dickens and her outgoing nature made this walking tour quite enjoyable. It was cool to see the pictures she found of what the street the workhouse Dickens worked at looked like back in Victorian times. 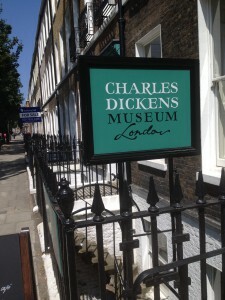 The Dickens House brought more connections to bridge (or mind, hah!) 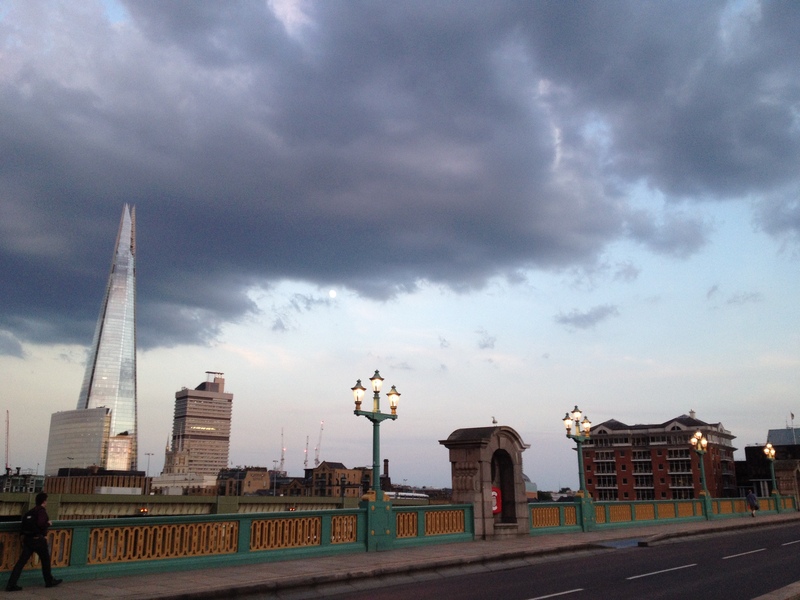 the gap between Dickens’s works and London. 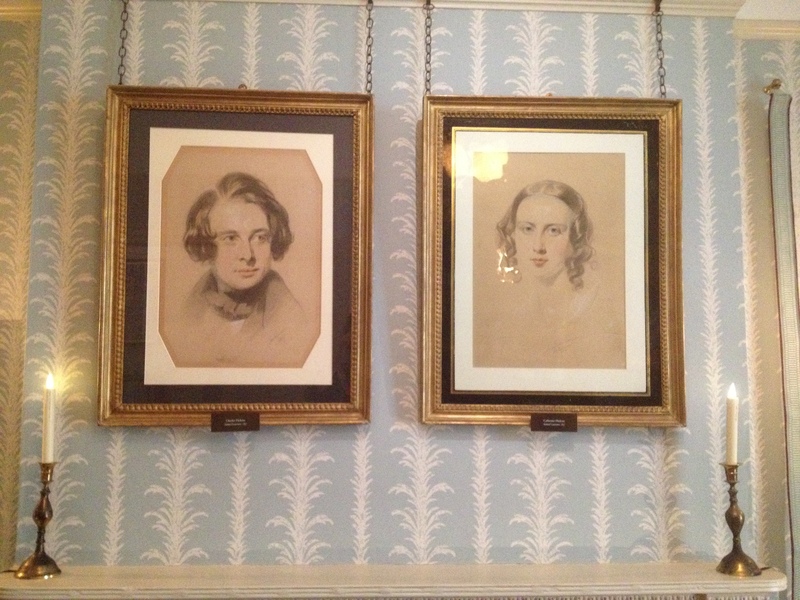 Dickens wrote a lot about young females encountering death, which was inspired by the sudden death of his sister-in-law in one of the rooms. Diana took us on a second tour of the house after we walked around to get our first impressions. I was happy she did that because she elaborated on a lot of things that I would have glossed right over. I’m excited for our upcoming Dickens House collaboration project. Charla and I will be attending a fundraiser party on Friday to take pictures and write a short article about the even for the House’s website and Facebook. I enjoy mingling with others and am constantly on social media, so this project is the perfect fit for me! These past couple days we have been all over the city! However, my two favorite destinations were the Houses of Parliament and John Keats’s house. The two locations may not be similar, they are both very beautiful and very influential. The Houses of Parliament was so striking to me. The stained glass window, ornate detailing, and especially the portraits and statues of the various monarchs and Prime Ministers of the past. 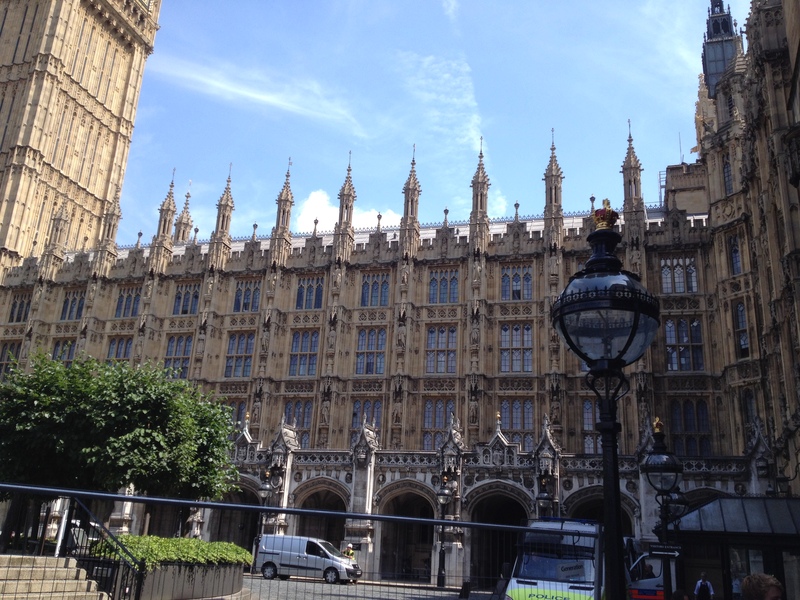 We were able do do an audio guided tour, and the history of how the government of England became the House of Lords and the House of Commons was so interesting to me. If I wasn’t a Psychology major I would be a History major, and British history is, in my opinion, one of the most fascinating parts of history. 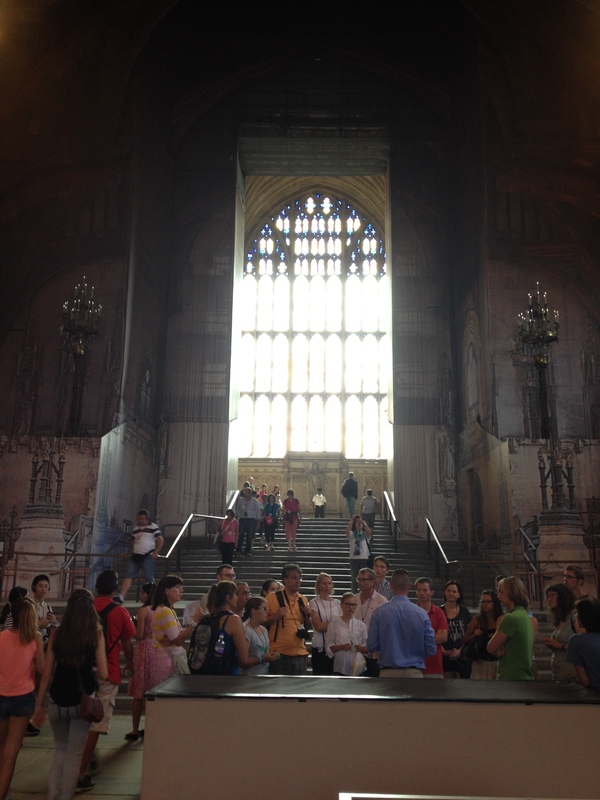 I could have walked around the Houses of Parliament all day learning about the history of Britain’s government. 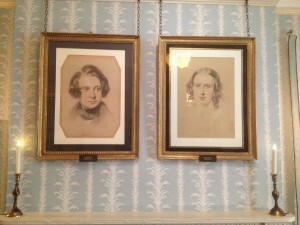 John Keats’s house was also a sight to behold. The house is very unassuming on the outside, but it has a breathtaking garden and a lovely interior. The house is a small museum detailing Keats’s short life, and we were lucky enough to come in right as a tour was beginning. As a history nerd, I loved learning about Keats’s life and how he was influential to British romantic poetry. After, we sat in the garden and read a few of Keats’s poems, which made for a tranquil moment. Though these two instances were quite different, they were both interesting to me because they gave me a better picture of parts of London’s culture. The Houses of Parliament showed me the part that is involved in government, that does not want to go back to the absolute monarchy of centuries past. 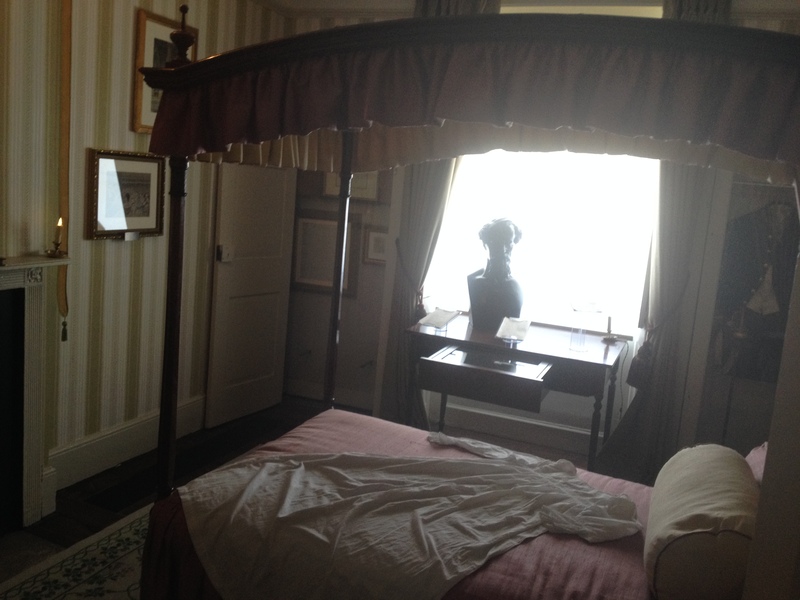 Keats’s house showed me the more sensitive, romantic, and deep side of London. These two intertwine in the architecture of the Houses of Parliament. The decoration inside is flowing and artsy, like Keats’s poetry, but the outside is very pointed and exacting, like the more serious political side. Today was all about walking and acquainting ourselves with the city. While my legs may fall off, I was so excited to finally get to tour this beautiful city. One thing I noticed throughout the day was the old and new weaving together in the landscape, architecture, and culture of the city. 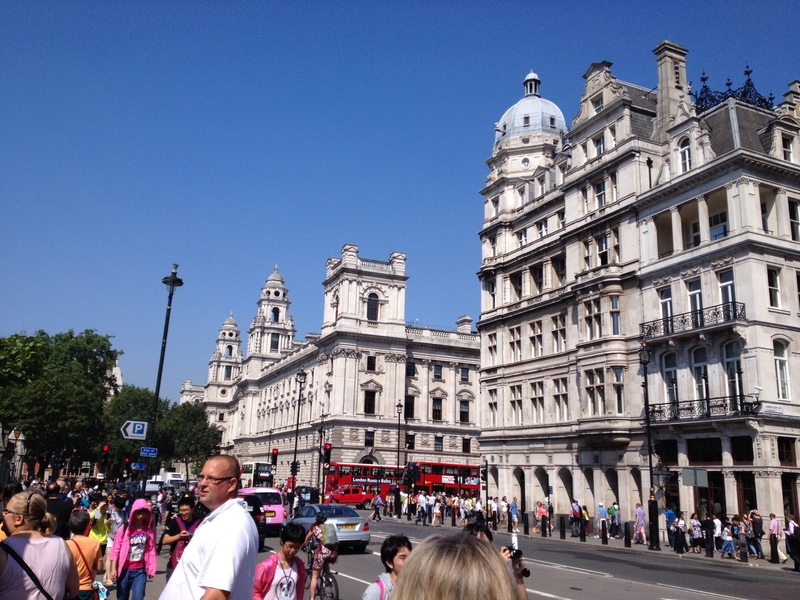 Our morning walking tour of the traditional tourist sites, such as Westminster Abbey, Buckingham Palace, and the Houses of Parliament, showed me the traditional architecture that has been in the city for hundreds of years. However, crawling throughout these historic landmarks were bustling streets full of cars and busses, and the Tube was running right below our feet. 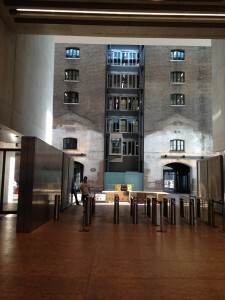 While London continues to take pride the buildings that showcase their extensive history, the city is extremely modern. During our second walking tour of Kings Cross station, St Pancreas, and the University of the Arts, the disparities between old and new architecture were highlighted again. King’s Cross station is an extremely old building, but inside held Eurotrains and modern art. In the University of the Arts, Carol Ann pointed out to us that the old garage markings on the brick walls of the University. The city allowed the University to use an old building, but set rules to ensure that history was not destroyed. 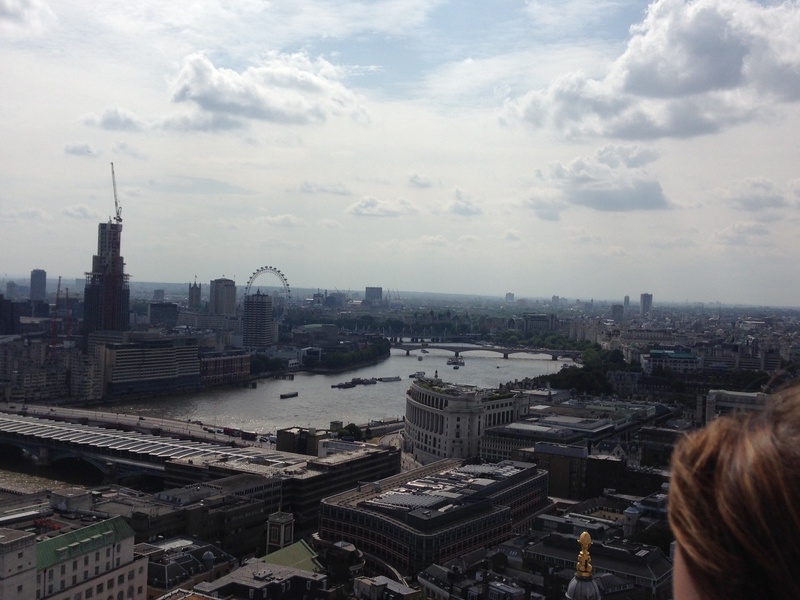 After our walking tours, we went to The London Eye. It was amazing to see a bird’s EYE (hah) view of the city, and the experience again highlighted the juxtaposition of old and new throughout the city. 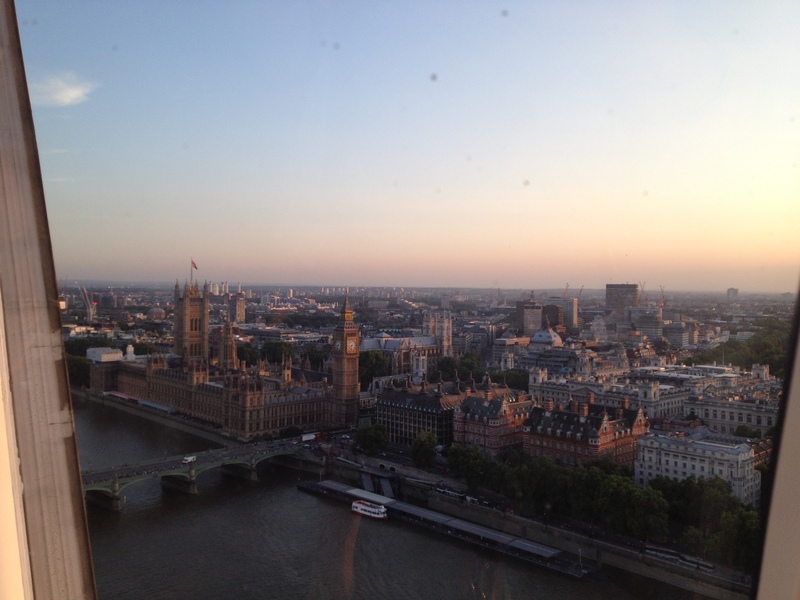 We saw Big Ben and The Houses of Parliament from the top of the wheel, but the eye itself is only about 14 years old. Londoners take pride in this new piece of architecture, and it has become almost as much a fixture of London as Big Ben. I’d like to think that this is a reflection of the culture of London. The city may be old, but the people are forward thinking, constantly looking for ways to modernize the city, without loosing sight of the past. My grandmother is my inspiration in life. She grew up in rural West Virginia, and moved to New York City as a single, young woman in the 40s. She was an adventurous spirit, and did not let the attitudes towards women of the times stop her from following her folly. Her adventurous spirit has certainly been carried on to me. I’m an anxious wreck in almost every other aspect of life, but for some reason traveling does not make me nervous. I want to see the world, and experience different cultures. I went to London on a school trip in high school, but I never got to ingratiate myself into their culture. When the opportunity to study in London for three weeks presented itself, I couldn’t pass it up. Of course, the Literary London program is through the English department, but I am a Psychology major and an Education minor. However, I am very involved in the theater program here at UML, which is a part of the English department. I think that all of my passions-psych, education, and theater-will be brought together on this trip. I’m excited to observe how people of a different culture think and interact, and I am equally excited the various theater performances we will be attending. See everyone in London, and long live the Queen!